(Bloomberg) -- Investors are too downbeat on the outlook for an overhaul to Brazil’s pension system and the currency will rally by year-end, according to one of the real’s most accurate forecasters. The real will strengthen back to 3.6 per dollar by the end of December after passage of the pension bill -- seen as key to shoring up Brazil’s finances -- and as the dollar weakens, said Commerzbank AG’s You-Na Park. She was among the top analysts for the real in the second, third and fourth quarters of last year, according to Bloomberg rankings. Brazil’s real slumped 3 percent Wednesday, and recovered only slightly by mid-day Thursday to about 3.98 per dollar, amid increased fears that the political friction between President Jair Bolsonaro and some key allies will hinder the progress of efforts to reduce the government’s pension burden. Concerns rose further after the economy minister, Paulo Guedes, said that if he lacks support to pass the bill, he could leave office. 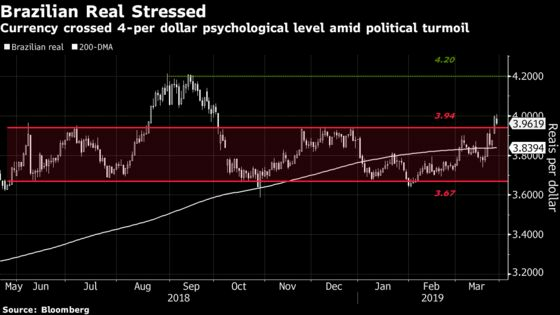 The strategist said there’s no reason for the currency to trade as weak as the 4 per dollar psychological mark that was reached yesterday, though spikes beyond that level could occur as the political turmoil fuels doubts. However, for the real to stay at those levels traders would have to price in a failure of the bill, which hasn’t happened yet. If there are signals that the approval will be delayed, investors would be OK with it, Park said.